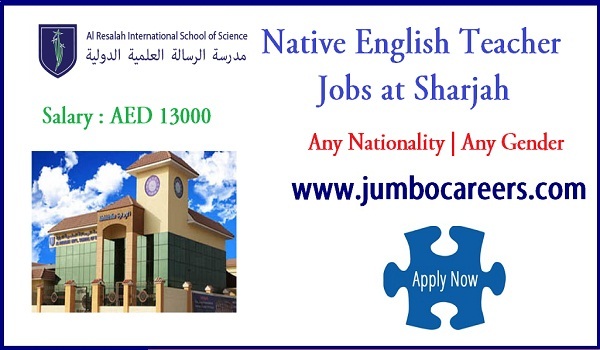 Al Resalah International School of Science Sharjah urgently hiring native English Teachers. About the School: Al Resalah International School of Science To uphold and fulfill trust of providing our students with a unique educational experience, inspiring a passion for seeking knowledge, and challenging students to reach and maximize their academic and social potentials. The foundation of their mission is built upon ensuring that their curriculum is developmentally appropriate, student-centered, resource plentiful, and reflective. As a result, the students will be equipped with the necessary skills and guidance to assume their role as productive citizens in the local and global community.